Richard Krukar’s practice specializes in patent preparation, prosecution and litigation. Dr. Krukar holds a Ph.D in Electrical and Computer Engineering. He prepares and prosecutes patent applications in areas where he has real world technical experience (see “Technologies” listed below). Dr. Krukar has also handled complex patent litigation. 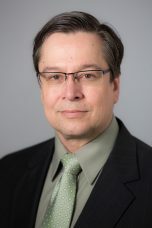 Dr. Krukar was a development engineer and a software and computer systems manager with Accent Optical Technologies in Albuquerque, New Mexico (previously Biorad Laboratories) where he developed and managed the control systems and factory automation interfaces for metrology tools as well as Linux based compute farms analyzing metrology data. He co-founded OpenLDAP, a non-profit foundation dedicated to the development and support of an open source software platform for the lightweight directory access protocol (LDAP). Dr. Krukar held a corporate R&D position at Lam Research Corporation of Fremont, California and was a Member of Technical Staff with AT&T/Lucent Bell Laboratories in Murray Hill, New Jersey.